Tillandsia flexuosa was one of those plants I got simply because I was fascinated by the way it pupped, but more on that later. It can be found growing naturally over quite a wide area, ranging from Florida in the United States all the way to northern South America. I am not entirely sure of the exact environment it grows in, but given its wide range, that in itself is probably a good indication that it is a fairly easy grower. It grows in a stemless rosette up to a height of about 12″, with its broad leaves tapering gradually. 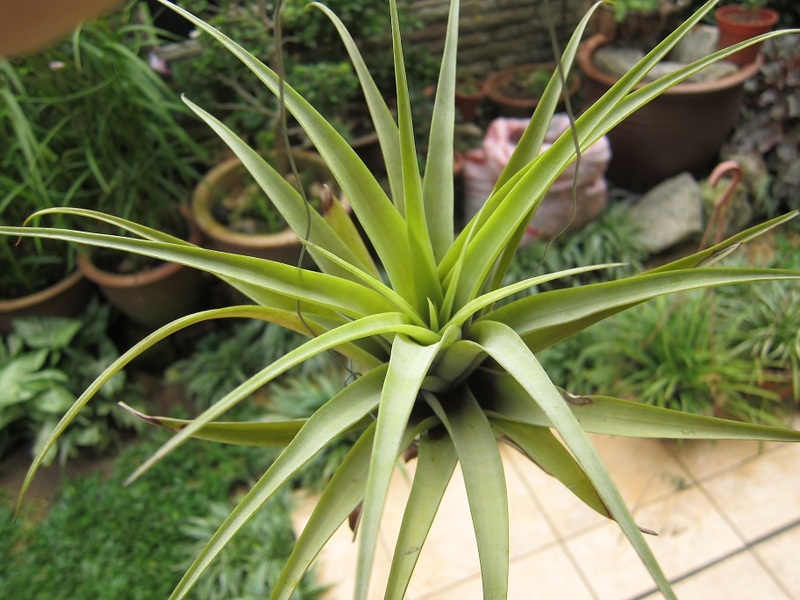 I always think it would blend in well with potted bromeliads because it does not have a heavy layer of trichomes giving it a greener look than the silver-grey colouring I like in Tills. This combined with its leafiness means, to me, it does not look right to have it hung by wires. Having said which, there is a ‘twisted’ form from the Bahamas which is absolutely gorgeous. Its leaves are darker green in colour making the striped markings on the underside of the leaves more obvious and as its name suggests, the leaves twist quite dramatically. This is currently on my wishlist! 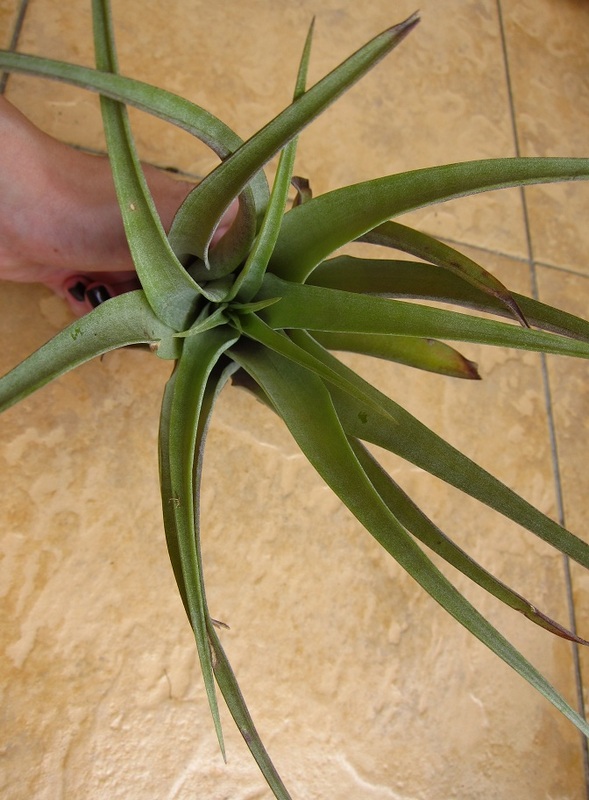 I got my flexuosa in June 2012, and it was a good sized plant, although being squished up in a tiny box for transport did not help its appearance any. I struggled with wiring up this plant, given is is larger than my typical Till, and so the wiring is not the tidiest ever, but it did its job and after a month the plant had opened up nicely and the rosette form is apparent. I then pretty much left it to fend for itself and it was happy to do its thing. After about six months it was doing well with nice new growth of leaves. 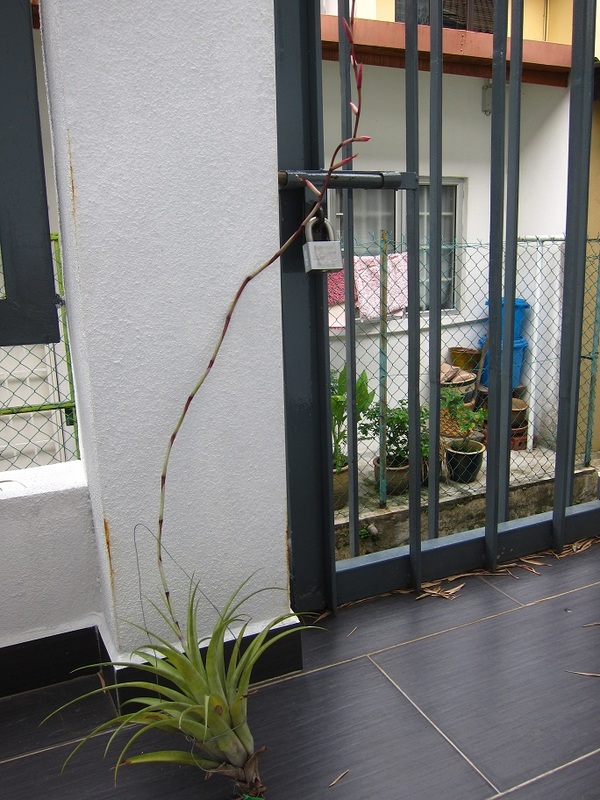 I always planned to rewire the plant or at least pot it with some stones as its media, but before I could get around to doing that, it started spiking. 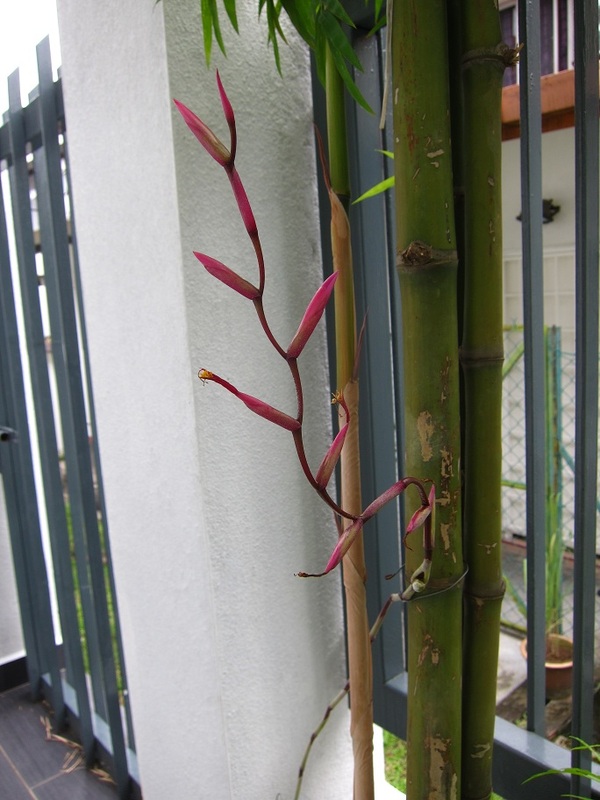 I could not find any pics of the early bud but this plant sure does gives out a long flower spike! 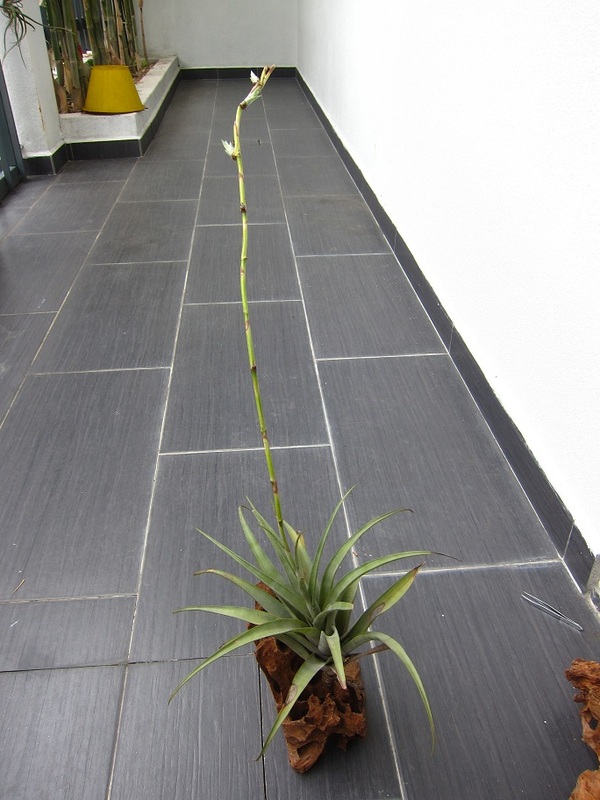 The pics below were taken about a month after I noticed the bud, and the spike is already the same length as the plant itself. 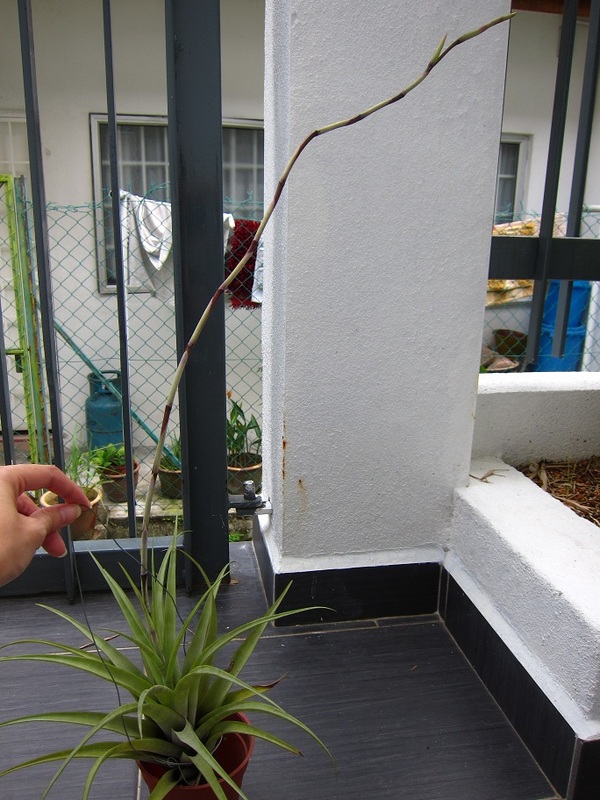 I used an empty pot to hold the plant, since the spike meant I did not have anywhere suitable to hang it. Fast forward another month and the spike was still growing. 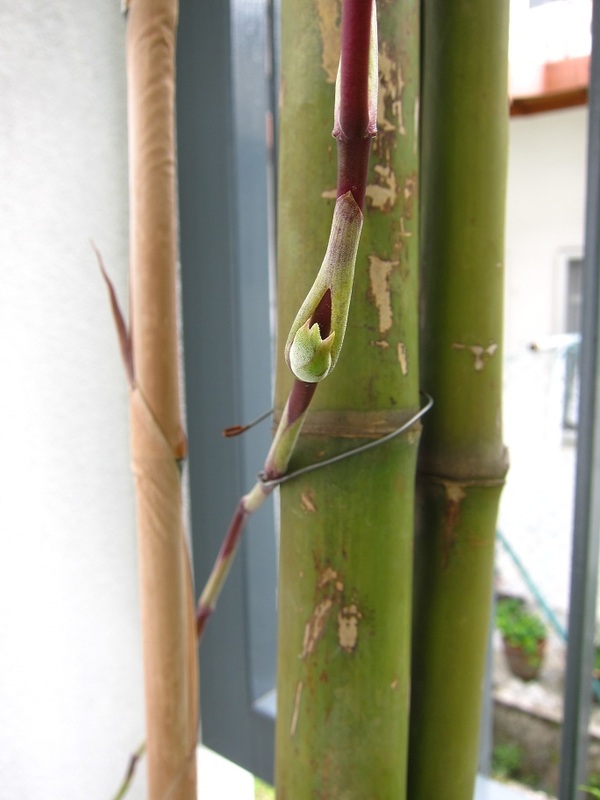 I was quite careful with the flower spike initially, being worried that I may snap it somehow, but as with all things Till related, it is surprisingly tough. 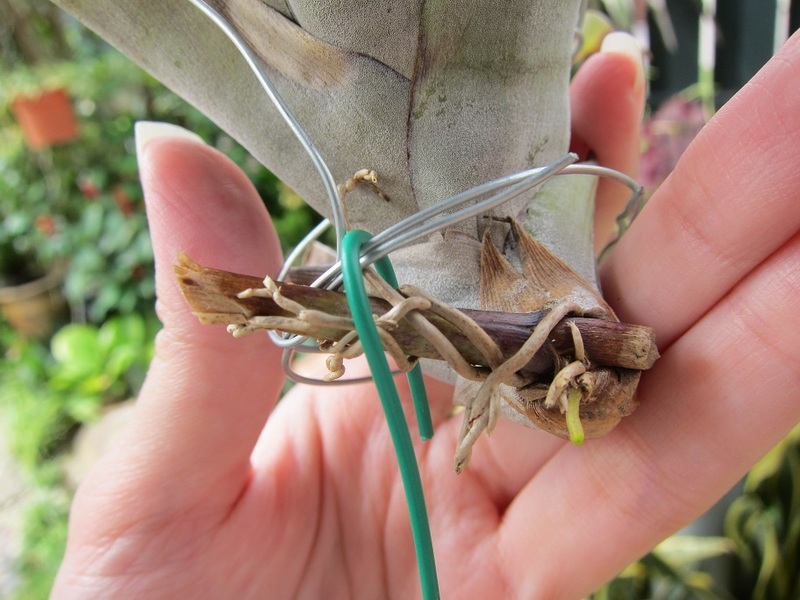 I now manhandle the plant using the spike swinging it this way and that with no ill-effect. 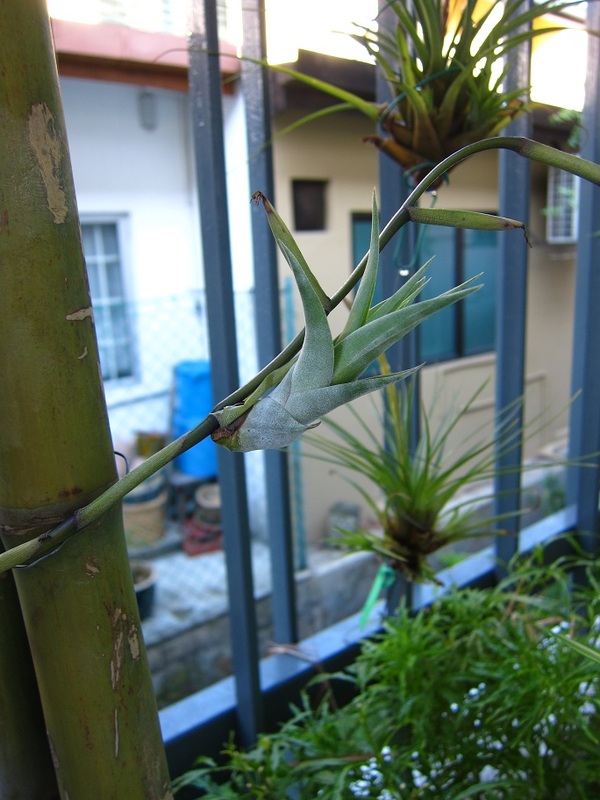 I should clarify I do the swinging around with the matured flower spike and not when the spike is still developing, as I feel it is of course more tender at that stage, but I do actually use the developing spike when moving the plant around and it is absolutely fine. All in all it probably took about three months from the bud to the first flower opening. After which the flowers bloomed individually over the course of about three weeks. The flowers were a nice deep pink in colour, very pretty. The plant was not done blooming when I made the first sighting of the whole reason I bought the plant in the first place, a little pup on the flower spike! This ability to pup from the flower spike is why you will often see this plant referred to as flexuosa var. viviparous. There are other viviparous Tills, and offhand I can think of three ; T. intermedia, T. secunda and a form of T. baileyi. I know there are others out there but I think these are the more readily available plants. Anyway I find it a pretty unique and interesting feature and visitors to my place seem to be similarly amazed at the sight. The pup grew steadily and the pics below were taken at approximately two months and five months after the first sighting. I was somewhat disappointed though at the fact that there was only a lone pup coming from what seemed to be a good-sized plant. I kept an eye out for further pups but none appeared. And because this pup appeared at the base of the flowering portion of the spike, I was very reluctant to separate the pup since I was not sure if the mother plant would pup further beyond that point. I was also kind of hoping some seed pods would appear, but once again, nothing. 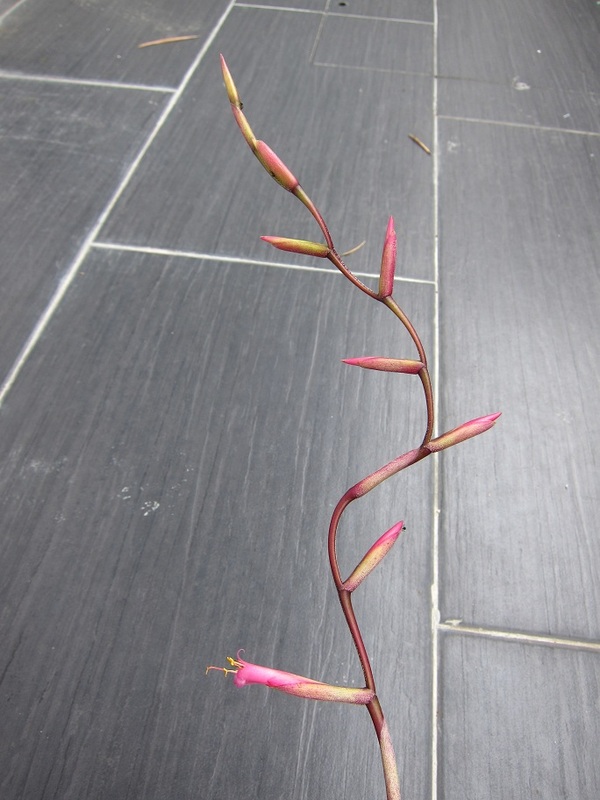 Below is a picture of the base of the parent plant, where you can clearly see the dried flower spike still attached. Well it was a good eight months later before I plucked up the courage to detach the pup which by now was a good size itself. I was hoping to separate the pup without breaking the flower spike (for the reasons I mentioned above), but no such luck. 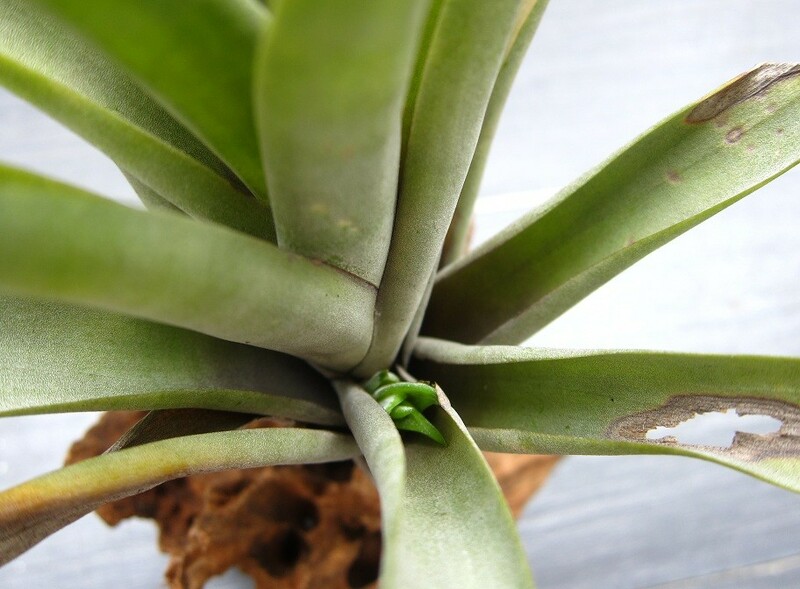 Once again I probably waited too long to detach the pup, because before I could even blink, I noticed that the pup was spiking – although it is not obvious in the pics below, there is already a flower bud! This is what the pup looked like just a week ago. As for the mother plant? Well I was worrying for nothing, as lo and behold it is now giving out half a dozen pups! 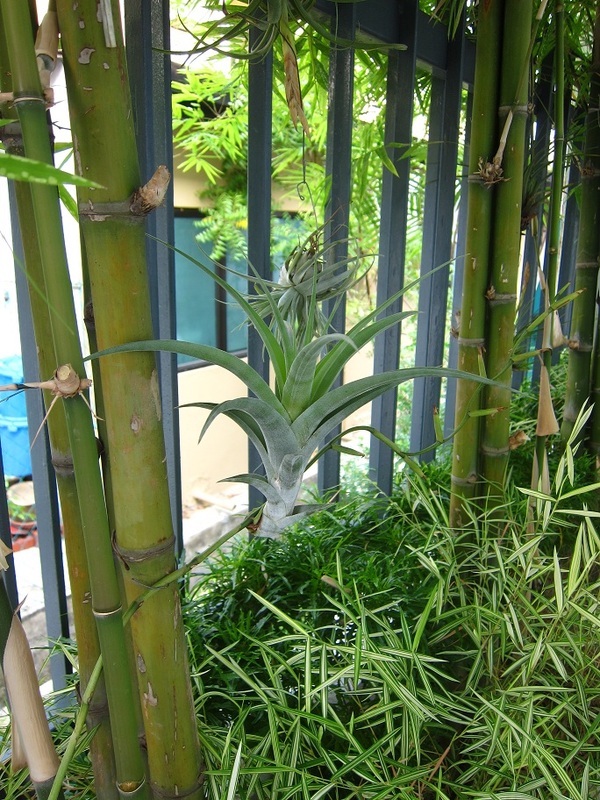 Five of which are on the truncated flower spike, with a lone pup coming out from the base of the mother plant. The wonders of nature indeed! The mother plant is not looking its best, yet seems determined to continue with the next generation. I expect these pups will be much more slow growing than the first one was, but I can live with that. This is a very easy plant to grow. It gets direct morning sun up until about 1pm, and is exposed to the elements. Because it has a cup, it does actually collect and hold water in its centre. I was initially worried about rot but it seems to enjoy being kept in this state. Because the current monsoon season means it rains virtually everyday, I do try to empty out the cup every few days just in case. I do this by suspending the plant upside down for a couple of days until I think the centre is dry, before flipping it back right side up, which seems to keep the plant happy enough. 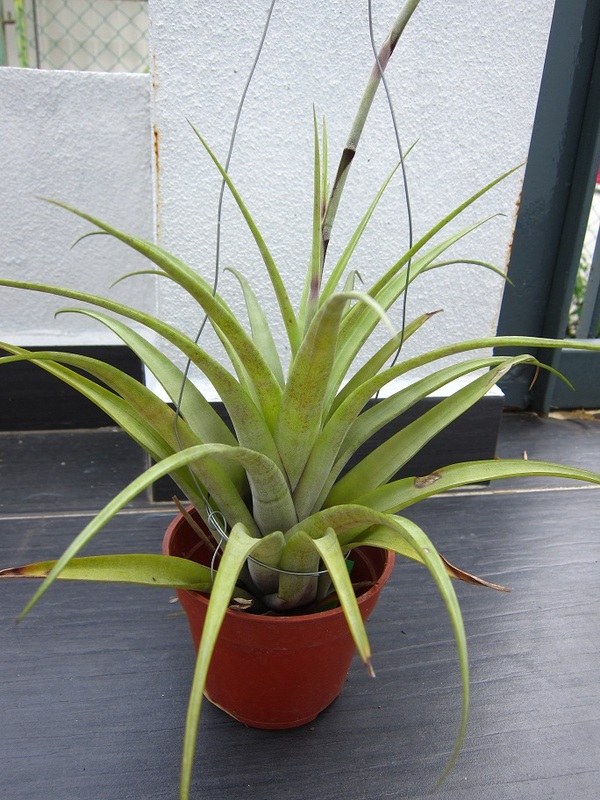 T. flexuosa is a nice unique plant which you should try to get your hands on as soon as possible. And if anyone has a source for the twisted form, be sure to hook me up! Happy growing all! i’m a reader from Singapore and is obsessed with your blog and your tillys! I am growing some myself too and have been waiting for them to spike. I think that is the best feeling ever. Is it possible to buy a pup from you!? I have wanted one of these forever! You don’t mention where you are based but I am assuming you are not in Malaysia. Wouldn’t have a clue how to go about sending plants off internationally I’m afraid. If however I am wrong and you are based in Malaysia, drop me another note here. 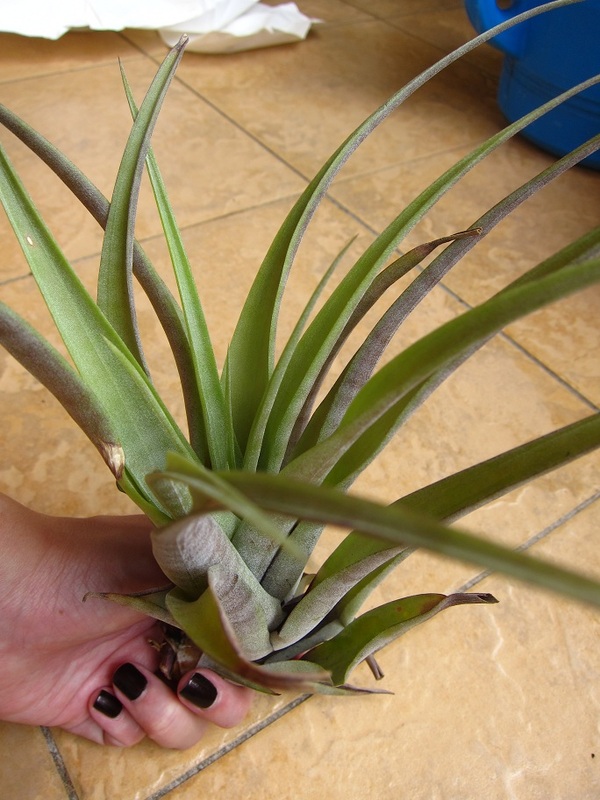 If you are based in the US there are many online sites where you should be able to find yourself a T. Flexuosa without difficulty. 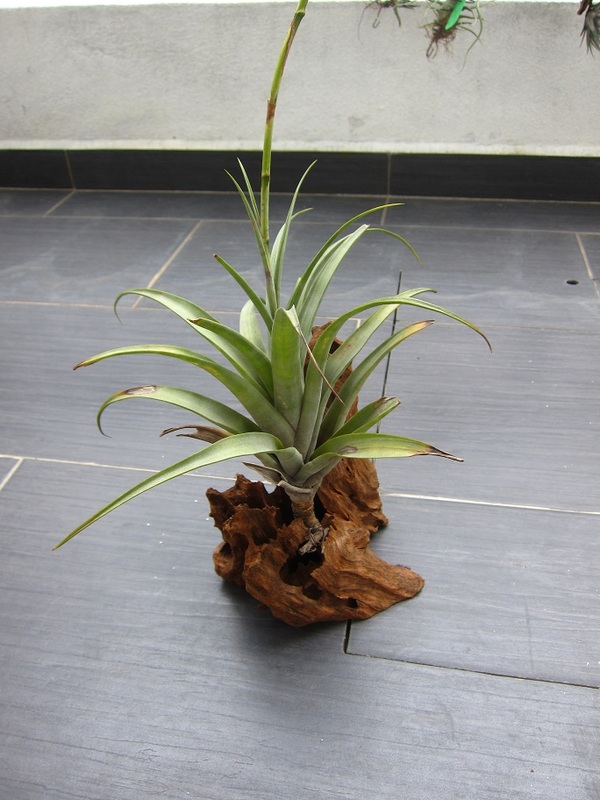 Hi minigemm, do u have tillandsia-flexuosa pups for sale? I am afraid most Tills blush red only when they are blooming and once they are done flowering the coloring disappears. Instead what you have to look forward to is many pups and for the whole growth and flowering cycle to start again. Thanks for the answer. From the 3, only the grey one (T. stricta) has grown some pups 🙂 I don’t know why the other 2 haven’t grown pups yet, otherwise they look fresh and healthy. Well I wouldn’t worry about it, Tills don’t necessarily pup frequently and some are notoriously shy puppers. The only time you are guaranteed pups is after they have bloomed. As long as they look happy they should be fine. Happy growing! 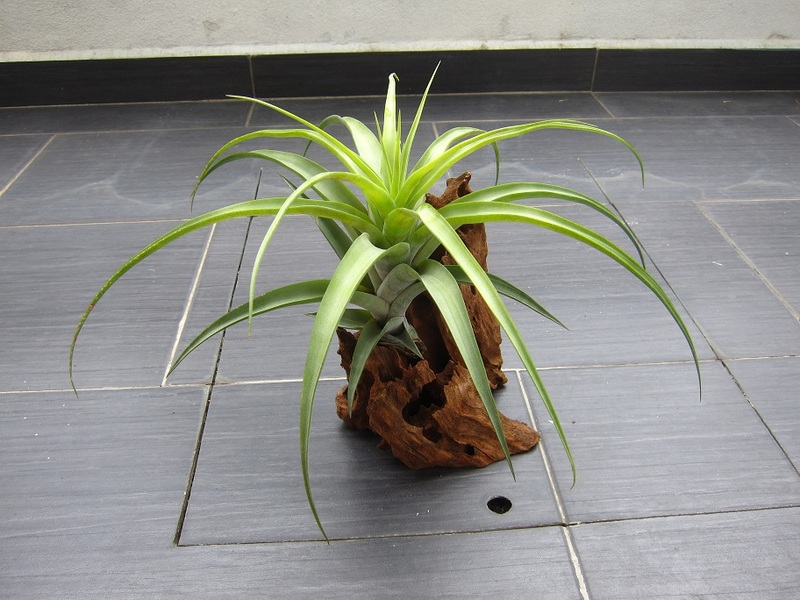 Hi, I’m living in Malaysia as well and I want to start growing tillandsia indoors and hopefully have a thriving plant wall. I’m so glad I found your blog, I feel like I could really commit to this project now. 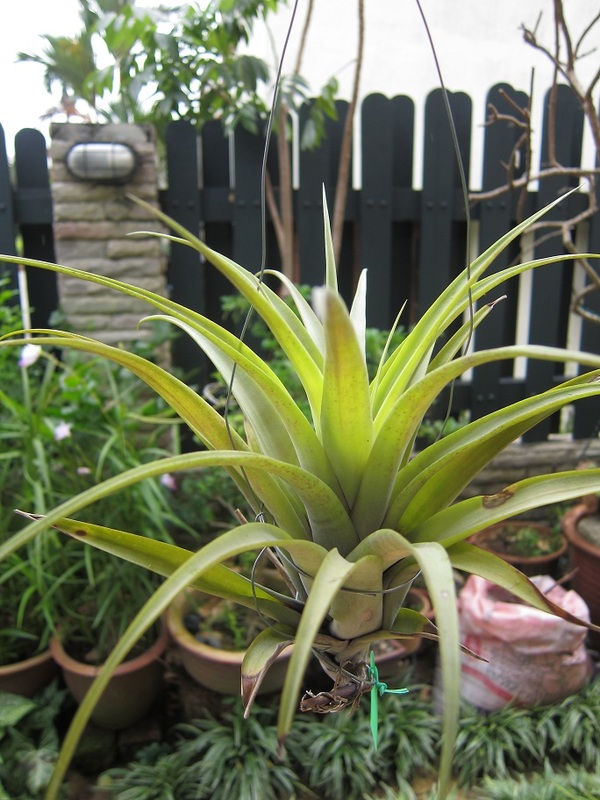 I would be so happy if you could share some contacts of where you found your tillandsia plants in Malaysia, with me. I’! be so happy! Thank you! Happy to be a source of inspiration. To start with I would suggest heading over to Sungai Buloh (nurseries near the hospital). They have a pretty decent range of Tills at reasonable prices. 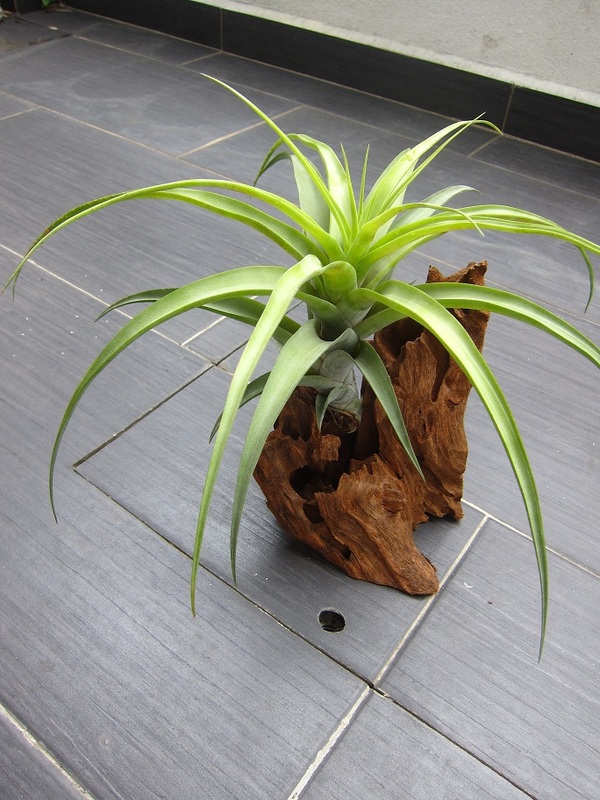 Head there often as the plants they have available varies depending on the stocks they receive. What do you have in mind for your indoor Till wall? I would caution that in my experience Tills don’t do particularly well indoors. They love the outdoors with good air circulation and refreshing rainwater. A porch / patio type thing probably works well, but a truly indoor wall may struggle to thrive. Just my two cents. Hope you have great success with your Till wall! Looks really nice. I don’t have experience to share but I would caution that Tills do best when there is good air movement. Enclosed like this they may grow very slowly or not at all. Happy for you to prove me wrong and would love if you could share your wall once it is complete. Oh and another tip, maybe go with T. ionanthas as they are hardy and cheap. Good luck!! I stumbled across your blog this morning & such lovely read! I’ve had a year of mistakes & killing some plants, but doing slightly better now. Do you sell some of your babies? I’m contactable below! Have a great day! Hello! 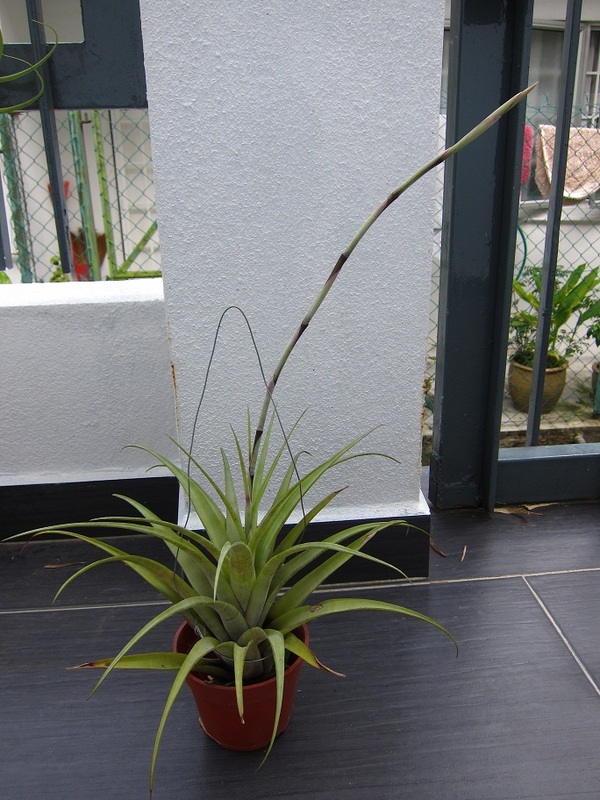 I stumbled across your blog while googling on Tillandsia flexuosa and I am fascinated! I’ve read every post you posted. 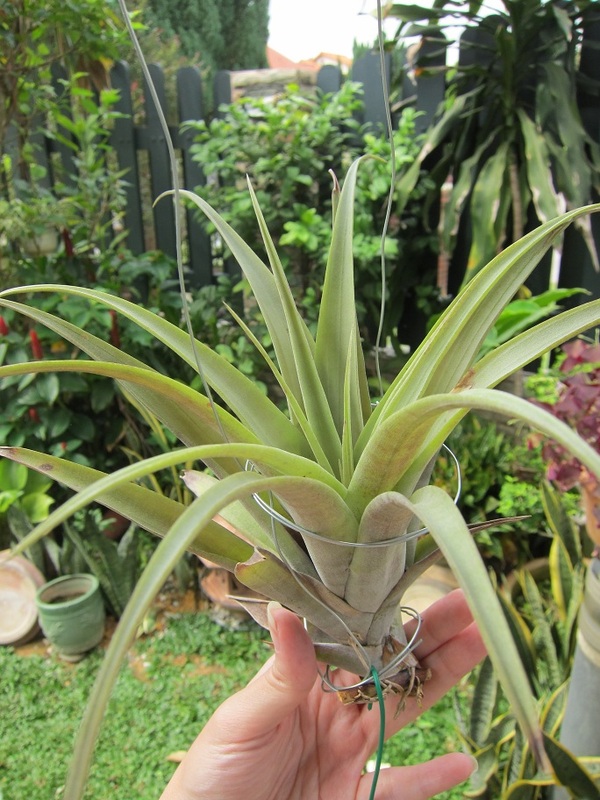 I am also a tillandsia enthusiast! Especially for pure breeds. Hehe. Recently, i chanced upon a good deal for my flexuosas. I have 2 separate ones. 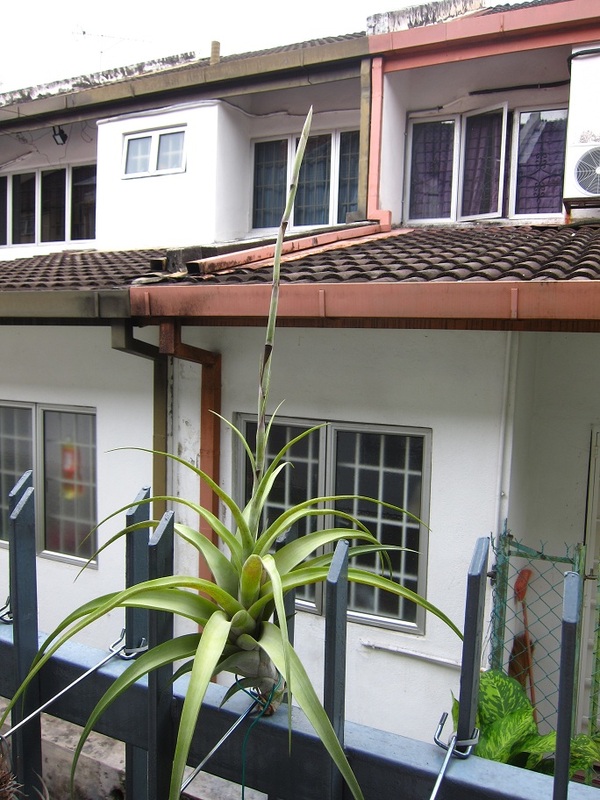 One had it’s flower stalk already broken at the top. Sadly, I accidentally broke the other one. I am devastated that I won’t be able to see my flexuosa bloom 😢 however, the one I broke is has produced 3 pups! One of the pups was infected with what seems like an insect burying itself in it and it just dropped out one day so I’m left with 2. I kept my flexuosa in my sheltered balcony but it seemed to dry out. Probably due to the heat in Singapore. So I decided to put it in my cooling toilet in front of a frosted window so no direct sunlight. It seemed to help but it still seemed dehydrated. The side of the leaves curl towards each other and they seem a bit wrinkled? I don’t really know how to revive it. 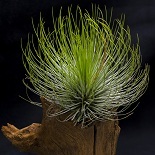 DAVIS FARM TILLANDSIA WHOLESALE HAS THE TWISTED FORM. 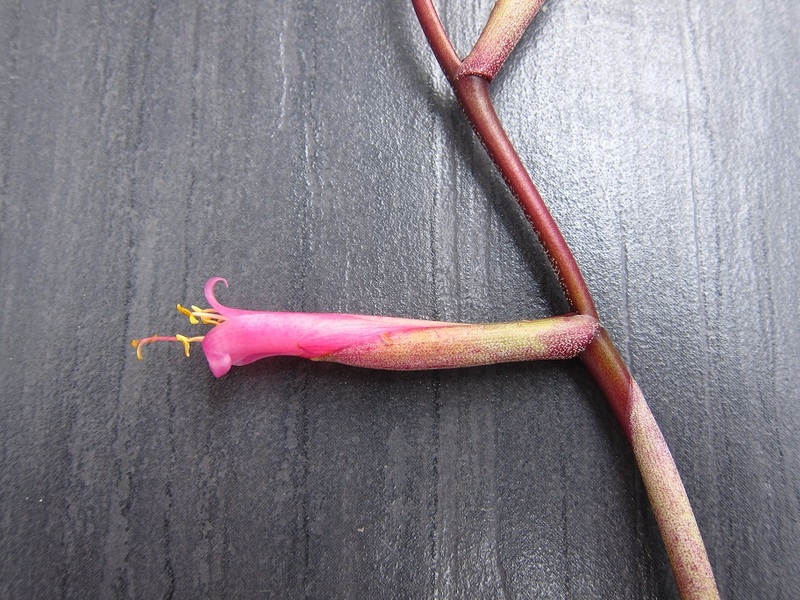 This entry was posted on January 19, 2014 by minigemm in flexuosa and tagged bloom, flexuosa, flower, Malaysia, offset, offsets, pup, pups, tillandsia, viviparous.